PVD Coatings have been applied as coatings for cutting tools commercially since about 1980 to improve wear resistance and extend tool life. Nowadays PVD Coating for Cutting Tools is considered essential to achieve the desired performance and minimise downtime. Many customers use heat treated alloys - together with a coating - sometimes known as press tool coatings. Try a plasma treatment an especially hard and wear resistant coating. Use PVD coatings to improve the wearing capabilities of your cutting tools and forming tools. 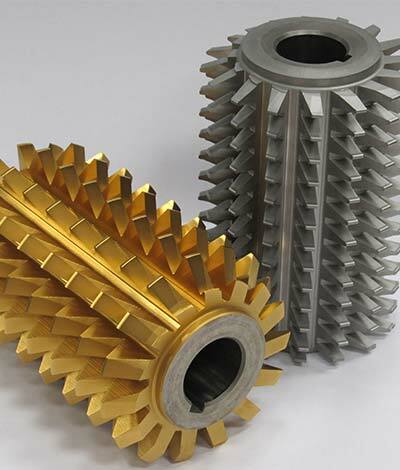 Initially the attractive gold coloured Titanium Nitride was available, however more hard wearing and lower friction coatings have been developed over the years. Traditionally these have been Titanium Nitride (TiN), Titanium CarboNitride (TiCN) and Aluminium Titanium Nitride (AlTiN) coatings, however now offer a very wide range of coatings are available to suit every cutting application. Hauck HT Ltd. provides a wide range of extremely hard PVD coatings which can be applied as coatings to the surface of all steel and carbide cutting tools. We also apply induction hardening where a high level of wear resistance is specified..
Chromium Nitride is a further process that may be applied to harden cutting tools. Sometimes this is known as Chrome Nitride heat treatment. We also offer plasma treatment for steels to harden surfaces for special circumstances. Contact us for more details. PVD Coatings can be applied to a wide range of Cutting Tools.